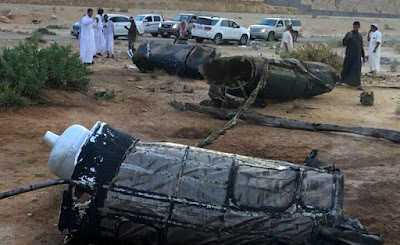 NCRI - The Prime Minister of Yemen has stated that the ballistic missiles and drones currently being used by the Houthi militia to target Saudi Arabia are made by Iran. Ahmed Obeid bin Daghr is the leader of the internationally recognised Yemeni government that was forced to flee in 2014 when the Iran-backed Houthis took over the capital. On Saturday, after a cabinet session in Aden, Daghr stated that the weaponry that the Houthis are using wasn’t something that the country’s’ army ever had. This counters a previous claim by the Houthi militia that their weapons had been seized from Yemeni military bases following the Houthi coup, rather than made and supplied by Iran as Saudi Arabia suspected and the UN confirmed. Daghr also noted that the Houthis are being controlled by Iran, which means that they don’t have the ability to agree to peace on their own. Iran does not want peace, which is why they intensified the Houthi’s rocket attacks against Saudi Arabia, in an attempt to make the Arab coalition to reinstate the internationally recognised government back away from peace talks. The Houthis have launched dozens of ballistic missile attacks against Saudi Arabia since the civil war began. Many have been destroyed by Saudi air defences before they can pose a danger to the Kingdom, but recently a civilian was killed and two were injured by falling debris from a missile. During the meeting, at which Daghr was present, the Yemeni cabinet discussed the latest developments in the war against the Iran-backed Houthis. This includes the victory of the Yemeni army and the Saudi-led Arab coalition against the Houthis in Midi and their advances on Houthi-held areas like Saada, al-Baydha and Taiz. Those present at the meeting praised “the ongoing military and resistance sacrifices aimed at restoring the state’s authority, liberating what remains of territory still under Houthi control and defeating the destructive Iranian agenda”. The meeting found, as noted above, that the Iranian regime is responsible for the Houthi’s ballistic missile attacks on Saudi Arabia. The members of the Yemeni cabinet even called on the United Nations Security Council to preserve international peace and stability by acting against Iran. They advised that the Iranian Regime is held responsible for its violation of UN resolutions, with regard to its supplying of the Houthi militia with ballistic missiles.